Laos – jewel in the rice biodiversity crown | A balanced diet . . .
From 1995 to late 2000, the International Rice Research Institute (IRRI) through its Genetic Resources Center (GRC, now the TT Chang Genetic Resources Center) coordinated a project to collect and conserve the genetic diversity of rice varieties that smallholder farmers have nourished for generations in Asia and Africa. The collecting program also targeted many of the wild species relatives of cultivated rice found in those continents as well as Latin America. With a grant of more than USD3 million from the Swiss Agency for Development Cooperation (SDC) the project made significant collections of rice varieties and wild species at a time when, in general, there was a moratorium on germplasm exploration worldwide. The Convention on Biological Diversity had come into force at the end of December 1993, and many countries were developing and putting in place policies concerning access to germplasm. Many were reluctant to allow access to non-nationals, or even exchange germplasm internationally. It’s not insignificant then that IRRI was able to mount such a project with the full cooperation of almost 30 countries, and many collecting expeditions were made, many of them including IRRI staff. As Head of GRC from 1991 to 2001, I developed the project concept and was responsible for its implementation, recruiting several staff to fill a number of important positions for germplasm collection, project management, and the research and training components. I have written about the project in more detail elsewhere in this blog. One of the most important strategic decisions we took was to locate one staff member, Dr Seepana Appa Rao, in Laos (also known as the Lao People’s Democratic Republic) where IRRI already managed the Lao-IRRI project for the enhancement of the rice sector. This project was also funded by the SDC, so it was a natural fit to align the rice germplasm activities alongside, and to some extent within, the ongoing Lao-IRRI Project. 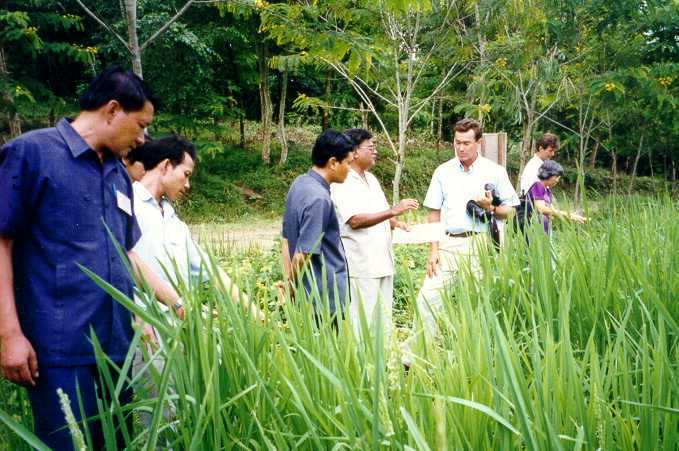 The leader of the Lao-IRRI Project was Australian agronomist, Dr John Schiller, who had spent about 30 years working in Thailand, Cambodia and Laos, and whose untimely death was announced just yesterday¹. Until Appa Rao moved to Laos, very little germplasm exploration had taken place anywhere in the country. It was a total germplasm unknown, but with excellent collaboration with national counterparts, particularly Dr Chay Bounphanousay (now a senior figure in Lao agriculture), the whole of the country was explored and more than 13,000 samples of cultivated rice collected from the different farming systems, such as upland rice and rainfed lowland rice. A local genebank was constructed by the project, and duplicate samples were sent to IRRI for long-term storage as part of the International Rice Genebank Collection in GRC. Duplicate samples of these rice varieties were also sent to the Svalbard Global Seed Vault when IRRI made its various deposits in that permafrost facility inside the Arctic Circle. Appa Rao and John Schiller (in the center) discussing Lao rice varieties. Im not sure who the person in the blue shirt is. In the background, IRRI scientist Eves Loresto describes rice diversity to her colleague, Mauricio Bellon. Of particular interest is that Lao breeders immediately took an interest in the collected germplasm as it was brought back to the experiment station near the capital Vientiane, and multiplied in field plots prior to storage in the genebanks. There are few good examples where breeders have taken such an immediate interest in germplasm in this way. In so many countries, germplasm conservation and use activities are often quite separate, often in different institutions. In some Asian countries, rice genebanks are quite divorced from crop improvement, and breeders have no ready access to germplasm samples. Appa Rao was an assiduous rice collector, and spent weeks at a time in the field, visiting the most remote localities. He has left us with a wonderful photographic record of rice in Laos, and I have included a fine selection below. 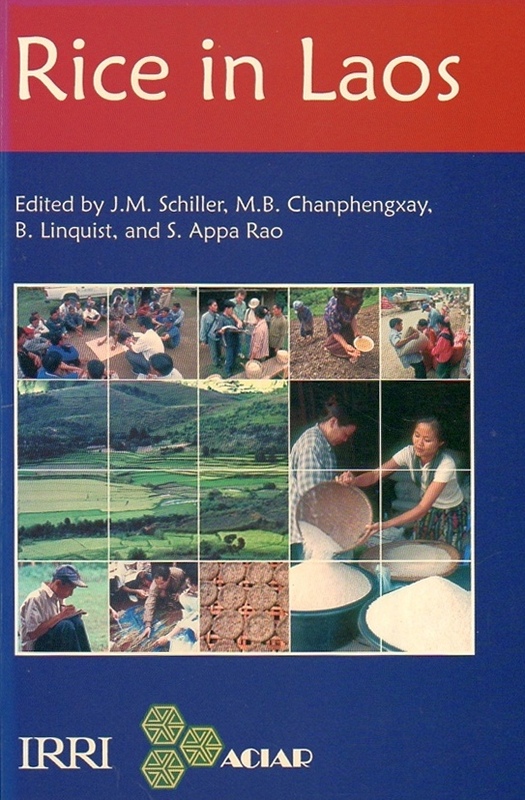 We also published three peer-reviewed papers (search for Appa Rao’s name here) and seven of the 25 chapters in the seminal Rice in Laos edited by John and others. The rices from Laos now represent one of the largest components (maybe the largest) of the International Rice Genebank Collection. Many are unique to Laos, particularly the glutinous varieties. ¹ Yesterday, I received an email from one of my former IRRI colleagues, Professor Melissa Fitzgerald who is now at the University of Queensland, with the very sad news that John Schiller had been found in his apartment just that morning. It’s believed he had passed away due to heart failure over the course of the weekend. I first met John in November 1991, a few months after I’d joined IRRI. He and I were part of a group of IRRI scientists attending a management training course, held at a beach resort bear Nasugbu on the west coast of Luzon, south of Manila. The accommodation was in two bedroom apartments, and John and I shared one of those, so I got to know him quite well. 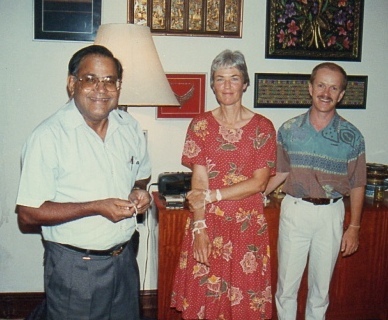 Our friendship blossomed from 1995 onwards when we implemented the rice biodiversity project, Appa Rao was based in Vientiane, and I would travel there two or three times a year. 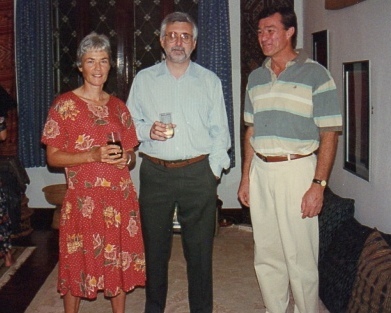 In February 1997, I had the opportunity of taking Steph with me on one trip, and that coincided with the arrival of another IRRI agronomist, Bruce Linquist (with his wife and small son) to join the Lao-IRRI Project. We were invited to the Lao traditional welcoming or Baci ceremony at John’s house, for the Linquists and Steph. 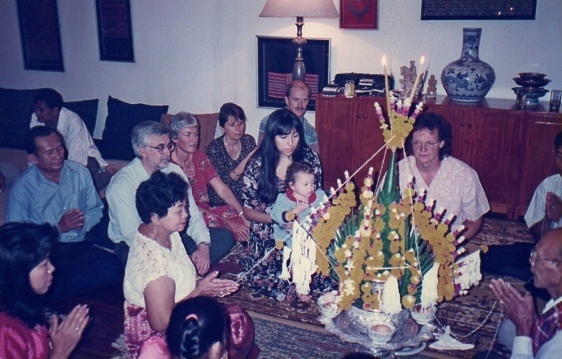 I’d already received this ceremony on my first visit to Laos in 1995 or 1996. John also arranged for Appa and Chay to show Steph and me something of the countryside around Vientiane. Here were are at the lookout over the Ang Nam Ngum Lake, just north of the capital, where we took a boat trip. L to R: Mrs Appa Rao, Appa, Kongphanh Kanyavong, Chay Bounphanousay, Steph, and me. After he retired from IRRI, John moved back to Brisbane, and was given an honorary fellowship at the University of Queensland. He continued to support training initiatives in Laos. As he himself said, his heart was with those people. But let John speak for himself. My other close colleague and former head of IRRI’s Communication and Publications Services, Gene Hettel, overnight wrote this eloquent and touching obituary about John and his work, that was published today on the IRRI News website. Just click on the image to read this in more detail. This entry was posted in In the news, IRRI, On my mind . . ., People, Science and tagged Asia, genetic resources, germplasm conservation, Global Crop Diversity Trust, IRRI, John Schiller, Philippines, rice, Seepana Appa Rao.